It’s not too often that a typical convicted murderer becomes a source for not just law, but also literature and science. George Foster (sometimes spelled George Forster despite few, if any, contemporaneous spellings as such) managed just that on this date in 1803, and his legacy lives on to this day. Foster’s case was, in the annals of capital punishment, unremarkable. He was accused in the drowning of his wife and youngest child in the Paddington Canal, one of the many canals being improved at the time to connect various parts of England by water. Foster was found guilty based on circumstantial evidence and sentenced to hang at Newgate Prison on 18 Jan 1803. Shortly after 8 a.m., Foster was executed; minutes later, he was a science experiment. 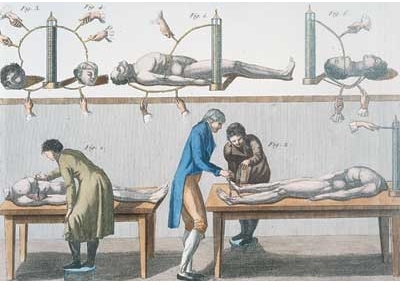 Professor Giovanni Aldini was the nephew of biological electricity guru Luigi Galvani, and he wanted to electrify a body. Galvani had shown that frog legs responded to electricity, twitching when current was passed through the muscle, and he was in academic competition with his associate and sometime dissident Alessandro Volta over why this occurred. Galvani claimed that an electrical fluid flowed through the corpse, activating the muscles; Volta said that the cells passed electrical signals between one another. It was this latter assertion that led to the development of Volt’s first battery, a voltaic pile. * Aldini was convinced that his uncle was right about electrical fluid, but he was keen on Volta’s ideas for creating portable electricity. A very ample series of experiments were made by Professor Aldini which show the eminent and superior power of galvanism beyond any other stimulant in nature. In the months of January and February last, he had the courage to apply it at Bologna to the bodies of various criminals who had suffered death at that place, and by means of the pile he excited the remaining vital forces in a most astonishing manner. This stimulus produced the most horrible contortions and grimaces by the motions of the muscles of the head and face; and an hour and a quarter after death, the arm of one of the bodies was elevated eight inches from the table on which it was supported, and this even when a considerable weight was placed in the hand. Which is not to say it was really difficult to get permission. On the first application of the process to the face, the jaws of the deceased criminal began to quiver, and the adjoining muscles were horribly contorted, and one eye was actually opened. In the subsequent part of the process the right hand was raised and clenched, and the legs and thighs were set in motion. Mr Pass, the beadle of the Surgeons’ Company, who was officially present during this experiment, was so alarmed that he died of fright soon after his return home. As a cultural icon, Frankenstein did exceedingly well. Considered a true Gothic novel, the story was remade for stage as early as 1887, turned into a variety of films which were subsequently parodied (c.f. The Rocky Horror Picture Show, “Treehouse of Horror II”, The Re-Animator, etc. ), retold on radio, brought up in song, and re-written in novels. Galvanization was never mentioned directly in that book, but the studies at the College of Surgeons were clearly an inspiration. And galvanization transcended that book, striking a chord in the public imagination. It continued to pop up in publication for decades after the Aldini/Foster event, for instance in the 1836 illustration “A Galvanized Corpse”, in which the editor of the Washington Globe, Francis Preston Blair, is shown being “galvanized” by two demons, who represent the interests of Andrew Jackson. ** Indeed, the College of Surgeons was receiving all hanging victims from London since 1752, and most were put through rigorous postmortems. Such scientific experimentation is also often blamed for the revival of Patrick Redmond in 1767, who received a windpipe incision following his hanging in Cork, Ireland; Redmond, however, was documented as hanging for just nine minutes, only slightly longer than the average person takes to die if deprived of oxygen. † Those interested in the history of cardiology in general should take a look at Louis J. Acierno’s The History of Cardiology; those interested in the use of human remains in medical science should seek out Human Remains: Dissection and Its Histories by Helen MacDonald. Around this date in the unspecified 18th-century year of Mary Shelley’s Frankenstein, the titular family’s servant is put to death for the murder of their youngest child, William. In the novel, smarty-pants university student Victor Frankenstein has created (and immediately rejected) his famous monster. Not long after, he receives a letter (dated May 12, “17–“) from his father informing him of the murder of his youngest brother. About five in the morning I discovered my lovely boy, whom the night before I had seen blooming and active in health, stretched on the grass livid and motionless; the print of the murder’s finger was on his neck. Covering the 600-plus kilometers home to Geneva, Victor becomes convinced that his creation is the culprit. * But upon reaching his destination, he finds that circumstantial evidence has accused the family’s blameless (and ironically named) servant, Justine. He’s back just in time to watch, in horror, as she’s convicted — impotent (or at least that’s what he tells himself) to help her with his fantastical truth, and despairingly watching her friends abandon her to her fate. Justine has grown up with Victor and the others, so the entire Frankenstein family remains convinced of the servant’s innocence, though they’re practically alone in Geneva in that belief. 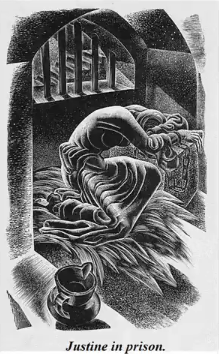 A woodcut illustration of Justine in prison, by Lynd Ward — as seen here. During this conversation I [Victor] had retired to a corner of the prison room, where I could conceal the horrid anguish that possessed me. Despair! Who dared talk of that? The poor victim, who on the morrow was to pass the awful boundary between life and death, felt not, as I did, such deep and bitter agony. And on the morrow** Justine died. Elizabeth’s heart-rending eloquence failed to move the judges from their settled conviction in the criminality of the saintly sufferer. My passionate and indignant appeals were lost upon them. And when I received their cold answers and heard the harsh, unfeeling reasoning of these men, my purposed avowal died away on my lips. Thus I might proclaim myself a madman, but not revoke the sentence passed upon my wretched victim. She perished on the scaffold as a murderess! not brooding thoughts of vengeance against the assassin, but with feelings of peace and gentleness, that will heal, instead of festering, the wounds of our minds. This advice, although good, was totally inapplicable to my case; I should have been the first to hide my grief and console my friends if remorse had not mingled its bitterness, and terror its alarm, with my other sensations. Frankenstein is available free at Project Gutenberg. Of course, it has been adapted many times into other cultural artifacts; these are somewhat famous for their infidelity to the original work, and Justine tends to get short shrift in most (although she’s hanged in quite an over-the-top spectacle in the 1994 Kenneth Branagh vehicle Mary Shelley’s Frankenstein (review here)). Nothing in human shape could have destroyed the fair child. HE was the murderer! I could not doubt it. The mere presence of the idea was an irresistible proof of the fact.